Looking for some advice from a seasoned wedding professional? Erica Ferrone has three big points that can help ease the stress of a wedding day. First: Make sure you book vendors that you feel comfortable and safe with. This allows you, as the client, to stress less and the vendors to work with more freedom, knowing that you trust them. Second: Don’t be afraid to make your wedding a day that YOU’RE happy with. Although it may be difficult to ignore some different requests and opinions from family and friends, it is most important that you are happy on your big day. Lastly: When it comes to her own personal field, Erica suggests knowing what time sunset is the day of the event. It’s no surprise that Erica has such well seasoned advice for new brides. 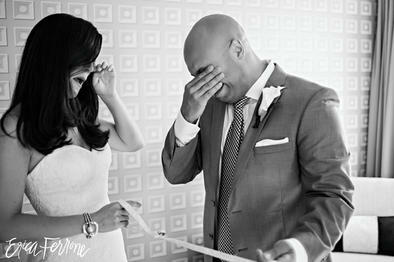 She has been a wedding photographer for 10 years and has photographed over 350 events. She makes sure that she takes her own advice, when it comes to making sure that clients feel safe with her. Although she knows that her main concern is the photography, it is not unusual for her to have to perform small tasks or solve small problems as they come up through out the day. She says, “Wedding photographers are the only vendor that will be with the couple for their entire day and the bride and groom should find someone that they like to be around and makes them feel comfortable”. To book with Erica, she suggests contacting her a year – a year and a half out from the wedding date.